My love for fashion is something that I take pride in. It is how I express myself so when other creative people are doing the same I feel happy and inspired. Recently I was introduced to a artist named Kelsey, the owner of Scribbles and Whimsy. She is a beautiful and talented girl and I am blown away by the package I received from her. Not only was it wrapped so cute, but what was inside made me so excited! To this day I love working with brands. Collaborating with other creative minds is my favorite part of blogging! But this is my favorite collaboration. She made me a custom print of one of my outfit posts. I'm speechless and I love the personal touch it adds to my photo wall you guys saw above! 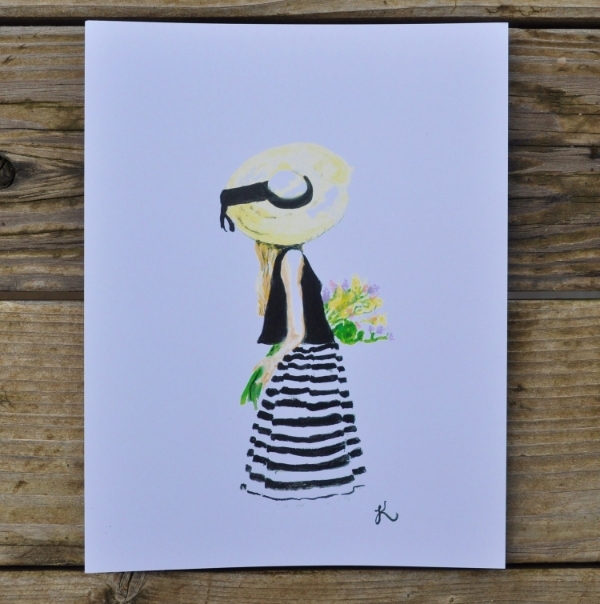 She does custom prints as well as tons of pre-made (absolutely stunning) prints you can find on her etsy shop here! Some of my favorites are below! You guys would be crazy to to recognize this girls talent! I am ordering more from Kelsey ASAP for my college dorm room (typical Emma plan way to far ahead) I love that I can share they brands with you all!